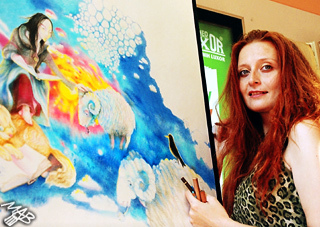 The project "Defense of the Colored Pencils" was originated by the artist Marie Brozova in 2004. She felt the need to show to a wide public as well as art professionals, that it is possible to draw really great drawings (great in their message and beauty, but also large in their format) with such humble art materials as colored pencils. The colored pencils have been accompanying Marie Brozova since her early childhood, just like every one of us. Maybe they are disregarded, even despised and refused as an "unsuitable" medium for "real art" because are so easy to get and you can see them everywhere in children’s hands. Marie met this prejudice shortly after she had entered the art school and she has been trying to push them forward ever since. Marie decided that it was important to defend colored pencils - openly and publicly - and at the moment the concept of her project, The Defense of Colored Pencils was born - a traveling project of public drawings, in frame of which Marie can prove what amazing things can be done with colored pencils. Her instinct was right; it is proved by growing interest of children visitors as well as adults, who come to watch intently the process of creation in Marie´s drawings. Marie is very glad about the fact, that her public drawings are often visited by school classes, and even gladder, when children come back in the afternoon and bring their parents with them. Also the references in media are entirely positive. The Defense of Colored Pencils has been shown in TV news and reports, and commented in public press. Marie is regularly referring about her project on the radio. Welcome to the fascinating world of Marie Brozova´s drawings - we believe you will like the excursion and hope to meet you at one of the following projects The Defense of Colored Pencils.